I usually try to keep Mondays as at home days, I like to do any baking and food prep that needs doing for the week on that day, this starts off our week on a (somewhat) organized note. Yesterday was a pumpkiny sort of day as I tried to use up some more pumpkin from the freezer. 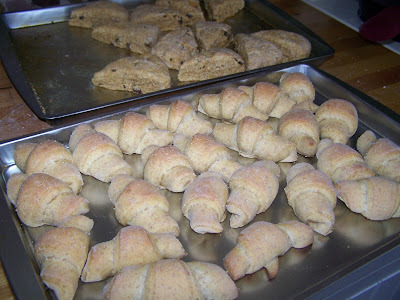 Last week I made pumpkin crescent rolls and they went down so well with our lunch of lentil soup that I decided to make another batch yesterday. 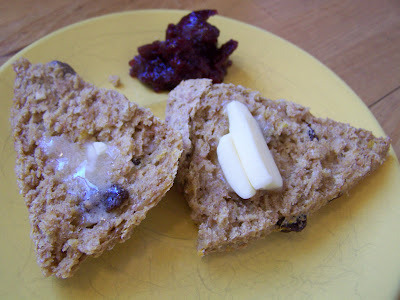 I also made some pumpkin raisin scones and they were absolutely delicious. These are sure to be a new favourite in our home. They went down a treat with a bit of butter and a spoon of last summer's cherry preserves. In large bowl mix all dry ingredients. Cut butter into flour mixture. In a separate bowl combine the eggs and pumpkin puree. 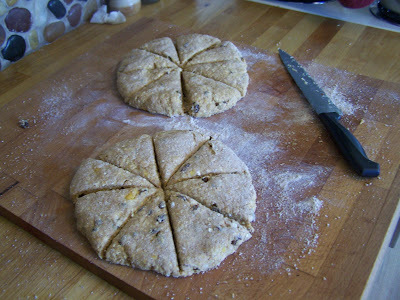 Add this to dry mixture and mix until moistened and then fold in raisins. (depending on how moist your pumpkin puree is you may need to add a tablespoon or two of milk or water here. 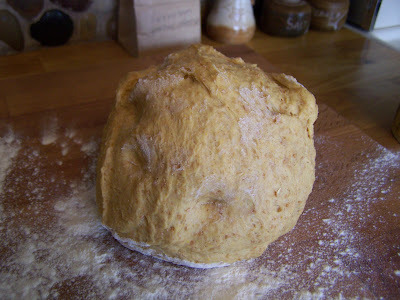 you want the dough to hold together nicely but not be too sticky) Turn out onto floured surface, knead a few times, divide into two equal pieces and then pat out into two circles. 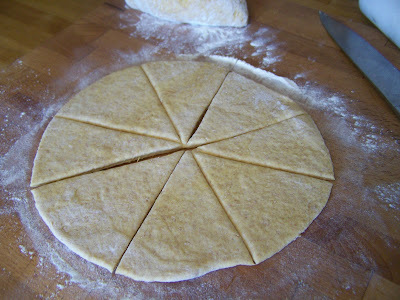 Slice each of these into 8 pie like wedges. Transfer to baking sheet. Bake at 350 for 20 minutes or until baked through. Best served warm with butter and jam or honey. Edited one more time to include the pumpkin roll recipe for Andrea. Here is a link to the pumpkin roll recipe. 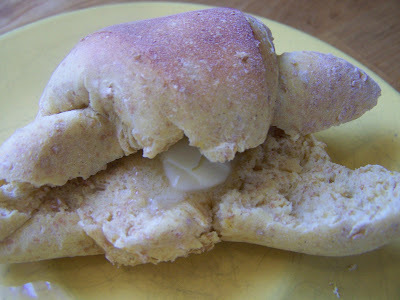 I have a Fleishmann's Yeast Bread Machine Favourites book and I found the recipe in there. It is online here on their website. I don't add the nuts though. 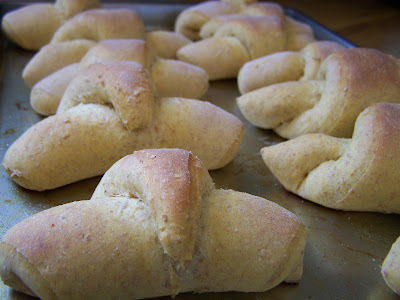 I just use the dough setting on my bread machine and then roll them into crescents. Oh and I use just cinnamon instead of the pumpkin pie spice mix. Any chance you'll share that recipe? What fabulous photos! Love those. Why not the recipe for the pumpkin crescent rolls? I'd love to have that one!